with kids, giving the clocks durability that far surpasses that of plastic models. We all know how important it is for kids to get a good nights' sleep; and we've designed the alarm clocks to promote just this. get any of that annoying ticking, and since they're analog clocks, they don't have any bright LEDs that interfere with sleep. - Cute and colorful design that brightens up the room. - Strong metallic frame to guarantee durability. - Audible alarm that isn't startlingly loud. - Straight forward to set time and alarm. - Battery operated to give them total portability. Count on these kids alarm clocks by Mehousa for a mix between fun design and thoughtful functionality. Click 'Add to Cart' now for the best value on Amazon and a 100% money-back guarantee! 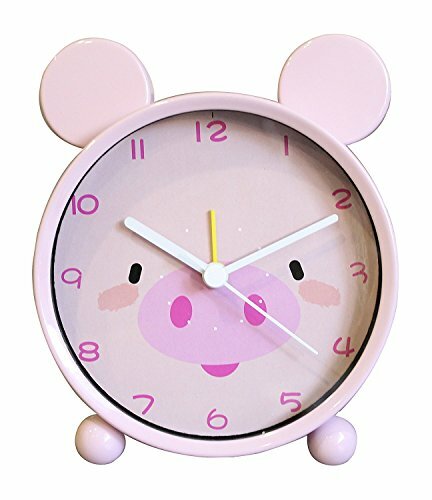 CUTE AND COLORFUL: This alarm clock for children will look simply adorable in the kids' room, with a choice between 3 animal-themed designs and vibrant colors that are great for boys and girls. BUILT FOR DURABILITY: The analog alarm clock is encased in a strong iron frame that doesn't break easily like cheaper plastic clocks. We've used a high quality paint that doesn't chip and is 100% eco-friendly. PROMOTES RESTFUL SLEEP: Your child will sleep better thanks to the lack of bright LEDs and the silent Quartz movement by Ostar. The animal alarm clock is just loud enough to wake but not startle. EASY TO USE: Simply insert a 1 x AA battery, set the alarm hand to the intended wake-up time, and flip the switch at the back to turn on the alarm. This simplicity makes it the perfect preschool alarm clock. BEST VALUE AROUND: This is the best deal on a battery powered alarm clock of this quality on Amazon. We complement this unmatched value for money with a 100% money-back guarantee and 5-star customer service. Click 'Add to Cart' now!